Parasite life cycle (click to enlarge). Giardia lamblia (also known as Lamblia intestinalis and Giardia duodenalis) is a parasite that infects the intestines and causes giardiasis or 'beaver fever'. Giardia affects humans, cats, dogs and birds, cows, beavers, deer, and sheep. 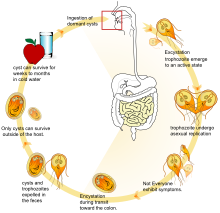 Wikimedia Commons has media related to Giardia lamblia. This page was last changed on 31 October 2017, at 06:48.